Most people don't realize, but when sending email to other people their email is sent in a plain readable format, so it's reasonably trivial for their emails to be intercepted and read. Not only that, copies of the emails are left on servers and can be stored and read in the future. But these are not the only reasons you should encrypt your email. Here's some other good reasons. 1. If email is left stored on email servers, then anyone with access to that server could also read those emails. 2. People you correspond with may not appreciate their information being sent insecurely. 3. It might be against the law in some jurisdictions to send medical and financial information without secure email. 4. It's no body else's business to read your personal email. EncryptUs makes sending emails safe. It does this by encrypting the contents of each email so that only the recipient can read it. The email cannot be read by anyone else while it is in transit. Working with EncryptUs is simple. Once it's installed, you still send and receive emails as you normally would. There's nothing special or different you need to do. 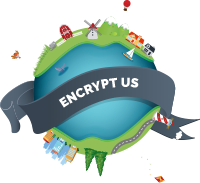 EncryptUs operates invisibly in the background, encrypting and decrypting emails automatically as it manages your cryptographic keys. Plus, EncryptUs is free to use.